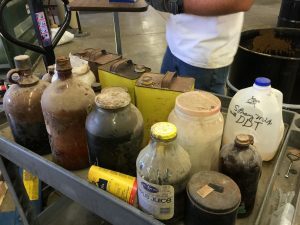 One of the toughest clean-up jobs for families is tackling a deceased relative’s chemicals, especially if the relative in question had hobbies or a profession that required unusual laboratory chemicals or now-banned materials. This week we helped a couple unpack a truck bed full of banned pesticides, including Chlordane, Lindane, and DDT, as well as containers that were no longer labeled. Kudos to these Marshall County residents! Handling these materials was messy, but they did the right thing and didn’t just dispose of these items in the trash, where they could have done serious harm to people and the environment. We are busy packing it all up for safe shipment to our vendor, NuGenesis, who will dispose of it all properly.